SERVPRO of Kirksville is always looking for ways to be involved with our local community. We periodically hold contests on our Facebook pages to give back to our loyal customers and members of the community. Our most recent contest was to give away a $25 gift card to Cancun Mexican Restaurant. Our lucky winner of this gift card dropped by last week for a photo op with her prize. For chances to be entered into our future contests and promotions please remember to like our page on Facebook and be on the lookout for our next post! If you have any suggestions for future contests we should hold, please feel free to message us on Facebook with your ideas! We are always looking for new ways to engage our local community! As members of the local community you can depend on SERVPRO of Kirksville to treat your home or place of business with the utmost care and concern. Whether you need emergency flood damage restoration or your upholstery cleaned we are always here and willing to help your situation. Our SERVPRO heroes take pride and integrity in their work and they will always work diligently to make your damage "Like it never even happened." Our professionals have the training, experience, and equipment to make your house feel like home again. 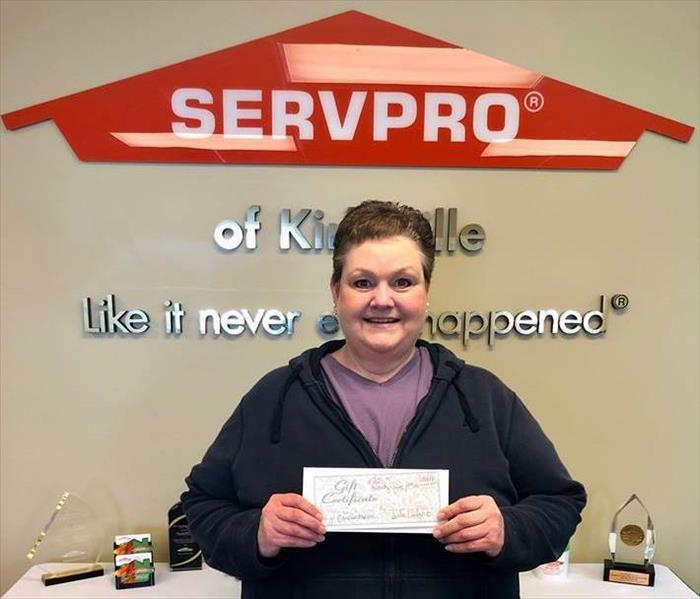 If you or someone you know needs assistance in their home or place of business, please call or text SERVPRO of Kirksville today at 660-665-3390 and we can make it "Like it never even happened." "Ted and Doris Isaacson launched SERVPRO in 1967 as a painting business in Sacramento, Calif. With a background in cleaning and restoration, however, Ted and Doris soon transformed the company into a franchisor of cleanup and restoration specialists. With a proud history, a successful present and a bright future, SERVPRO will press on toward becoming the premier cleaning and restoration company in the world." Then, don’t miss your chance to join our Franchise as a new Production Crew Chief. In this position, you will be making a difference each and every day. We have a real drive toward the goal of helping make fire and water damage “Like it never even happened”! Our Franchise is seeking someone comfortable working hard in challenging situations, enjoys meeting new people, has excellent communication skills, enjoys supervising others, and is a serious multi-tasker. If you are self-motivated and have superb interpersonal skills, then you’ll thrive in this work environment. Are you highly dependable and super-excited about routinely exceeding expectations? Thenyou may be our perfect hero! As a valued SERVPRO® Franchise employee, you will receive a competitive pay rate, with the opportunity to learn and grow. Explain the process and answer customer questions, as needed. Monitor, communicate and respond to customer needs/concerns. Cleaning and documentation of equipment and materials properly. With Spring in the air brings Spring cleaning! Did you know that SERVPRO of Kirksville does more than just water, fire, and mold? We will happily clean your residential and commercial carpets and upholstery as well! Have an event coming up? Spill something on the carpet? Traffic areas starting to look a little shabby? We have professional tools and advanced cleaning techniques to help you get your residential or commercial carpets back in action. We can help bring your waiting room or break room furniture back to life! We can even clean your office and desk chairs! If you are ready to spruce up your commercial or residential carpets and upholstery give us a call today at 660-665-3390 to have your carpets looking good as new again! This spring, make faucets clean and sparkly by rubbing a lemon half on the water stains. The citric acid helps remove hard water marks. Then, use the other half of the lemon for our next tip. Cut a lemon into halves, squeeze the juice into 1/2 cup of water and drop the rinds into the mixture. Microwave for three minutes and let it stand for five minutes without opening the door. The trapped steam will loosen the grime, so you can wipe the microwave clean with less elbow grease. Looking for more natural ways to clean your bathroom? Vinegar can dissolve the mineral deposits accumulate in showerheads over time, causing reduced pressure and water flow. Fill a plastic bag with white vinegar, secure it over the showerhead with a rubber band and leave it overnight to get rid of buildup. Just be sure to run the shower before you hop in, or you risk smelling like vinegar all day. Simply wet your sink and faucet, sprinkle baking soda, and scrub with a sponge. If you need more heavy-duty scrubbing power, add salt to the baking soda. Mix ¼ cup of white vinegar, 2 cups of water and 2 teaspoons of liquid soap into a spray bottle. Spray the mixture onto the glass and scrub with newspaper for a streak-free window or mirror. The ink acts as a mild abrasive and allows you to make use of old newspapers. Flooding emergencies don’t wait for regular business hours and neither do we. SERVPRO of Kirksville provides emergency cleaning and restoration services 24 hours a day, 7 days a week—including all holidays. Flooding is very invasive. Water quickly spreads throughout your home and gets absorbed into floors, walls, furniture, and more. SERVPRO of Kirksville arrives quickly and starts the water extraction process almost immediately. This immediate response helps to minimize the damage and the cleaning and restoration costs. The bottom line: a flooded basement can jeopardize your health, safety, and your home’s integrity. It’s worth making a call to SERVPRO of Kirksville and let our trained, professional crews handle the situation safely and correctly. We have earned the trust of hundreds of homeowners, business owners, and property professionals. When soot remains on an object, even if the soot is not visible, there will still be an odor associated with the soot. Often after a customer believes they have removed the source of a smell; the smell will remain. Leave it to our professionals to come in and inspect your home for soot damage after a fire. We will be able to use our advanced cleaning techniques, combined with our deodorization tools to return your home to a preloss condition. If you have any questions about the process of removing smoke odor from your home or business, please give us a call at 660-665-3390 today! When dealing with a fire loss in your home, the process can be overwhelming. SERVPRO of Kirksville is here to help ease the burden of trying to return your home back to normal. As a trusted leader in the restoration industry, SERVPRO of Kirksville provides 24-hour residential and commercial services. As a locally owned and operated business ran by members of the community, we’re dedicated to being faster to any size disaster, with the training, equipment, and expertise to handle your restoration and cleaning needs. SERVPRO of Kirksville technicians are highly trained and use advanced equipment and techniques to clean and restore your home. Our focus on training and documentation help our technicians make your house feel like home again. We always strive to make your emergency "Like it never even happened." 3/27/2019 - Congrats to Our Contest Winner! 2/21/2019 - Flooded Kirksville Basement?